The Sterlco® Float & Thermostatic (Model FT-96) is applicable to all types of steam pressure heating systems. The Model FT-96 traps’ purpose is to move air and water while preventing steam from entering return piping. These traps are manufactured in seven models for handling capacities of 1,500 to 54,000 lbs. 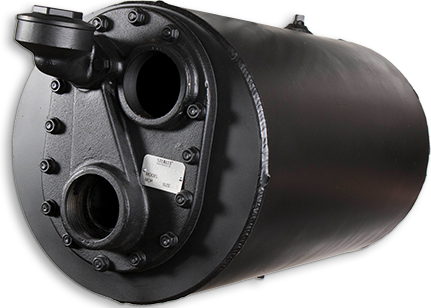 of condensate per hour and operate efficiently with pressures up to 60 lbs. Model FT-96, FT-96-10-125HC also handles capacities of 20,000 to 150,000 lbs. of condesnate per hour and operating pressures up to 125 lbs. Simple, rugged construction. This Sterlco® trap is a mechanically simple and durable combination of a float and thermostatic trap. All working parts are made of non-corrosive metals especially adapted for this service. Sensitive thermostatic action. Charging the thermostatic disc under high vacuum assures sensitive and positive response to temperature and pressure over entire operating range. Disc corrugations are shaped to reduce hinge action at the rim of the disc and evenly distribute disc motion. Instantaneous valve action. Design of the float vale assembly permits rapid and positive valve action. Location of the valve assures a deep water seal at all times. Continuous rapid flow of water. A lever operated discharge valve opens wide so that large volumes of water can flow continuously from trap. Thorough testing. In addition to tests made of the completed trap, each thermostatic disc is tested before it is assembled into the trap. Minimum maintenance. All working parts may be inspected, removed or repaired without disturbing piping. Clean-out plug permits easy flushing of dirt. Why Choose FT-96 Float and Thermostatic Steam Trap?